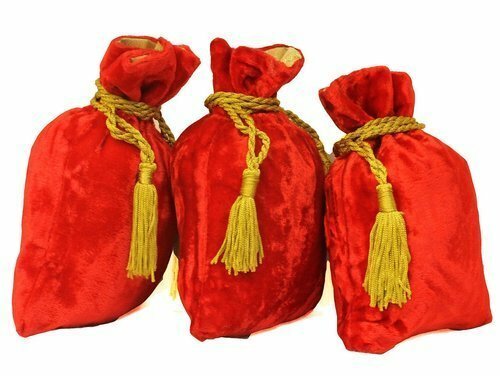 Encasa Home Gift Bags Solid Party Pouch (Red, Pack of 3) Rich looking velvet gift pouches with golden thread tessel for closing.The range of Gift Packing Bags can ideally be used for gifting purposes. these bags makes double value of gifts.This is so attractive and impassive. very easy to carry. this is for all your big event, Holiday, party, wedding, and birthday Christmas for all vocations these bags can ideally be used for wedding return gifts.Pack of three. Leading manufacturer and exporter of home furnishings products worldwide. We export all sorts of table linen, kitchen linen, home decor items like cushions and curtains, and ironing board covers.